It's never too early to begin your little super soldier's training! He's going to need some super moves, witty one-liners and, of course, this Toddler Captain America Costume! It's based on the Marvel superhero's suit from the comics, complete with stars, stripes and some buff muscles. He'll look tough enough to take on Loki, Ultron or that monster that he thinks is hiding under his bed. 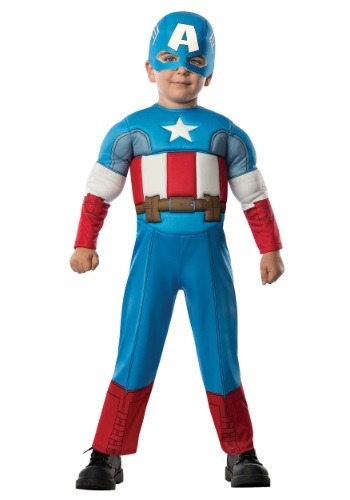 And we're going to just throw this out there, but you could always dress up in one of our adult Avengers costumes to form a family super group that fights villains once your child has this costume, so it totally gives you the perfect opportunity to wear a superhero costume of your own.